Trafalgar Wharf: Trafalgar Wharf Shipyard Offers Ship Owners Total Flexibility For Refits And Refurbishment With “Hire Only” Model. Trafalgar Wharf Shipyard Offers Ship Owners Total Flexibility For Refits And Refurbishment With “Hire Only” Model. Jonny Boys, MD at Trafalgar Wharf, has never been shy when breaking the mould. His new model for his shipyard, where owners bring in their own repair and refit teams, rather than being tied into the shipyard operator, is his new strategy to grow the business at Portchester. Being able to just hire the shipyard and control the project gives the owner the upper hand. Jonny’s brought in one of the most experience Dockmasters in the country to ensure owners get the best service possible. Chris Hems has carried out more than 300 lift outs and dockings for the US Army, Testbank Ship Repair and Burgess Marine, as well as working in partnerships with Wightlink car ferries, and Brittany Ferries Normandie Express at the 4000t Syncrolift in Cherbourg. The shipyard has had a successful period of growth with several Super Yachts. 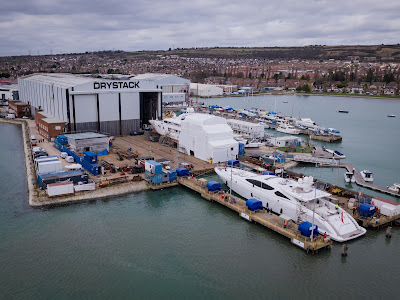 There has been ‘Shemara’, Owned by Sir Charles Dunstone and ‘Lady A’ owned by Lord Alan Sugar as well as a regular client base of Wightlink, Gosport Ferries and Serco who dock many of the Portsmouth Naval Dockyard support ships. For bookings and more information please contact Chris Hems, Shipyard Manager, Trafalgar Shipyard. E: chris@trafalgwharf.com M: +44(0)7713565045.